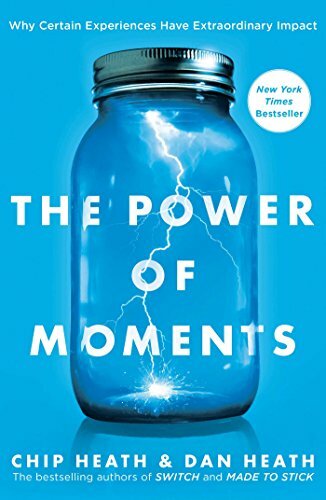 This is a review of the brilliant book The Power of Moments: Why Certain Experiences Have Extraordinary Impact. Think back on your life and there will be certain moments you can remember more vividly than others. These moments can strike up powerful emotions reminding you of what you felt at that given time. Moments when you felt a sense of pride either in yourself or a loved one for achieving something great or for showing a strength of character when the odds were stacked. Or in a moment of epiphany which causes you to change your entire view of something or someone. Perhaps it was a moment of realisation when you knew something in your life had to change. These are what you call ‘defining moments’ – the parts of our life that are both memorable and meaningful and remain with us forever. Defining moments stick with us. Usually forever. They leave an everlasting imprint on our psyche. The brain doesn’t retain every piece of information it receives. Doing so would be a waste of energy. Remembering the mundane parts of life serves no purpose. We’re often told by the self-development community to “live in the moment.” Sure, but a lot of moments are boring. Living in them would just make that work commute or wait at the doctor’s office all the more tedious. What the brain does remember, however, are the important or ‘defining’ moments. Those pinnacle times in life you remember and reflect on years after they happened. They shape who we are and can often change the course of a life. When almost every memory of that fateful day is forgotten, all that’s remembered is that defining moment and the person is has shaped you into today. A peak moment allows us to remember an entire situation perhaps more fondly than it was to fully experience. For example, when you travel, the peak moments you experience like scuba diving, beach life and meeting people will drown out the bad moments of airport delays, travel sickness and money theft that often come with backpacking. Or when a project you’ve been working on is finally launched and receives recognition and adulation, the stress, worry and sleepless nights that occurred while working on it, are often forgotten and all that remains are the peak moments of pride. In both examples, on reflection, the entire time is pinned to the peak moments which we retain in our memory and forget the bad. Creating moments as we age becomes more difficult. Why? Because we have already experienced many of life’s important moments. It will come as no surprise to hear that the majority of important moments in your life likely happened from the ages 15 to 30. This is called the ‘reminiscence bump’ – because of the novelty of many things that happen during that period. You likely had a lot of firsts: first kiss, first job, first time away from parents, first relationships etc. We have to continue to look for new and novel ways to create moments in the absence of those things. Introverts who take delight from reading a book or researching new information may find it easier to create moments as they age. Extroverts will have to continue creating moments in the physical sense. Think back again to those important moments in your life. Chances are many of them happened serendipitously. By chance or circumstance, you were thrust into them. Instead, we should be architects of our own and other people’s moments. We should create defining moments or at the very least create situations to improve the likelihood of them occurring. How do we do that? We have to get out of the routine of the day-to-day. Routines are good but they are generally not memorable. If you want to create moments you have to break the script. We need to be proactive and design our lives so defining moments can occur. We need to create moments for other people – be it friends, colleagues or clients. If you’re in business, what kind of moments can you create for the people you serve? Because in the end, all we will remember are the powerful moments.